This is the corner of Flinders Lane and Spring Street, in the CBD. Should be a priority pedestrian area — it’s certainly flagged that way under the SmartRoads strategy. But the zebra crossing that was here before has been removed and replaced with a traffic light. Which means that while before pedestrians had absolute priority, now they have to wait for the green man. Worse, unlike every other intersection in the CBD, the green man doesn’t activate automatically. Neither does pressing the button when the parallel traffic has a green light get you a green man until the next sequence comes around. So pedestrians are going to patiently wait ages to cross a tiny street, or more likely, they’re going to ignore the red man. Neither is a good outcome. If there’s anywhere pedestrians should have priority, this is it. It’s clear that in this case, they don’t. So what if you now wait 110 seconds to cross a road which can be crossed in three strides ! So what if your 60 metre stroll to the nearest coffee shop now takes 3 minutes each way instead of 1 minute. The car drivers will want to know that they can bowl up to this intersection at full speed on the main road and turn abruptly into the small road without having to signal or check for pedestrians. Your road is now “smart”. Why do the little green men not activate automatically? There seems to be no good reason not to. There seems to a be a policy to get rid of many zebra crossings. Another one in Glenferrie Road Hawthorn is about to disappear. I have noticed in Swanston Street in the city at night, at a certain time pedestrian lights stop activating automatically and require the button to be pushed. ^Andrew I tend to agree with the Hawthorn one. I’ve lost count of the number of times I’ve almost been bowled over by a Toorak Tractor at that one near Streetwise, when they think they own the road. At least they are more likely to take notice of lights. 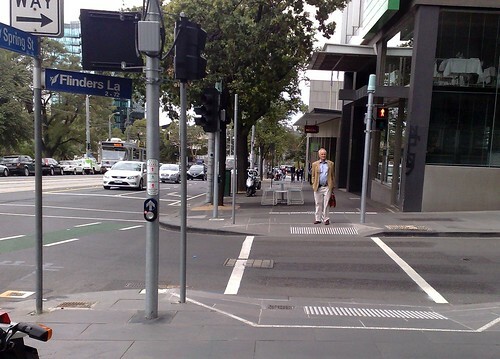 On this particular crossing there is now a green right turn arrow into Flinders Lane from Spring St. This is, I think, to get cars out of the tram lane (the city circle tram) as they used to queue here to get into Flinders Lane. Also cars coming from the Flinders St direction up Spring St would frequently block this intersection leading to a bigger car queue and more blockage of the trams. I conclude that they have done this in the interests of pedestrian safety as cars using a right turn arrow usually (not always) have right of way (ie usually pedestrian lights are red when there is a right turn arrow). You can argue the ultimate merits of having put the right turn arrow there in the first place but the subsequent replacement of a pedestrian crossing with a signal seems sensible to me (notwithstanding the timing issues). Hopefully it does prevent right-turning cars going into the tram lane by giving them their own lane and space, as well preventing car drivers failing to notice the zebra crossing (and before that existed, failing to observe the rule that they have to give way to peds when turning). Yes, the real issue here is the timing of the light, and the fact that the green man doesn’t self-activate. I do end up wondering if we had a lot more zebra crossings, would driver compliance be better? Can I bring your attention to naked streets design principles…where pedestrians can cross where they like within a specified zone, allowing easier access to shops and the market. Not sure on the more zebra crossings being safer. I think there’s a reasonable chance, in the same vein as the ‘no sings or signals’ school of traffic control, ie it’s always uncertain so everyone goes slower. Last time I crossed at a zebra (over two lanes of traffic) I stepped out into the first lane, saw a BMW flying down the road and thought better of continuing and wait for him to pass. The BMW driver sees me at the last minute, plants the anchors and stops half over the crossing. I shrug and keep going now he’s stopped, only to have him yell after me “if you want to kill yourself, walk out like that again”…. ummm… approach crossings at 20km/h not 60 perhaps?? Naked street design place importance on how drivers make decisions about their behaviour, recognising the the importance how they perceive their surroundings. The trouble with the VicRoads over control is the lack discretion and traffic speeds up and “demanding” it’s rights. => more likelihood of a pedestrian collision. If a car doesn’t stop after I’ve already stepped out at a zebra crossing or green man, I jump-kick the door as it passes – it makes a loud noise and often dents the panel. The driver usually freaks out; they often come back to yell at me, but walking towards their car scares them off. Don’t try it on busses, though – I once shoulder-rammed a bus that took a corner after I’d stepped out with a green man as hard as I could; I saw stars, but I don’t think it actually did any damage to the bus. Dave, I’d definitely be giving that driver a serve back. Some ped crossings are placed on speed humps, though I’m not sure about this — to some drivers it may look like a speed hump which is not a crossing? Herschel, yeah the stuff about increasing signage vs not is interesting. Perhaps the trend to drop speeds in shopping areas + no restriction crossing if you’re 20m+ away from a marked crossing will help this in Melbourne. Vas, good for you! Yeah, wouldn’t be taking on anything big! @Andrew I agree that is barmy: if a pedestrian light is going to self-activate, it should do so 24 hours a day, and they should remove the button (as they do in Singapore and KL) – or perhaps replace the button with a small 200×100 sign that says “Auto” (and a pedestrian symbol + arrow). @Daniel It would be worth lodging a formal complaint to VicRoads about the lack of auto-activation (and possibly having to wait for the next cycle), and push it to the Ombudsman if they give the predictable response. “Hi, there’s a pedestrian push-button not working – signal number 411. Umm it’s the pushbutton to cross Hawthorn Road on the eastern edge of Springvale Road, walking north-bound”. Vas, do you really want regular drivers to be thinking “there’s that nut that kicked my car…” next time they drive there? I’d say pedestrian-activated lights are safer than zebras. Cars stop for them – running a red light is considered a serious offence. If only pedestrians (and bikes) considered walking against the red man to be a serious offence. @mike: yes, I want them to think, “There are psychotic pedestrians around,” every time they consider not stopping at a pedestrian crossing, or queuing across an intersection, or not looking for pedestrians when turning. These scum need to be woken up before they run someone down, and making them aware that they risk having their car damaged appeals to their selfishness – they don’t seem to show any other feelings.